Last week when I was looking at my local grocery store weekly sale ad…they had a great deal on pork loin. So, this week I made my menu around alot of PORK items. I could feed my family of 6 for under $10.00 per meal. The huge piece of PORK was under $15.00…they were $1.29 per pound. 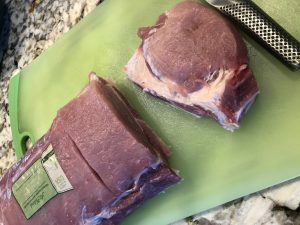 I can make thit nuong, spring roll, use the broth to make soups (after boiling the pork for my spring roll), make banh mi thit nuong, banh xeo (asian crepe) the ideas were endless…so this week…many of my meal planning will revolve around this HUGE PIECE of PORK LOIN. I took out my food processor and use half of it to make ground pork…I separated it into FREEZER ziploc bags for 2 of my meals this week. I can use ground pork to make egg rolls, wonton for my soups, use it in my hu tieu, make salty/sweet minced ground pork to eat over a bowl of jasmine rice..there are so many possibilities. So…STAY TUNE for more meal ideas this week using PORK!! Combine ALL the ingredients in a large bowl. Add the sliced pork to the bowl. 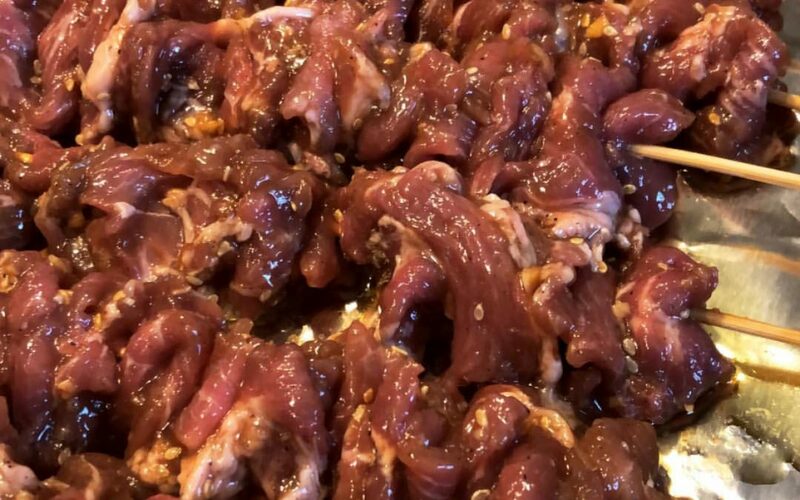 Using your hands, massage the meat and marinade to make sure that the marinade is evenly distributed and coats every slice of meat. Allow the meat to soak in the marinade overnight or for up to 24 hours. Line the baking pan with FOIL…this will help with cleaning up. Set aside. Next, soak the skewer (bamboo stick) in water for about 20 minutes. This will prevent the skewer (bamboo sticks) stick from burning. 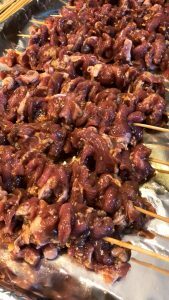 Then taking each slice of meat and skew it into the bamboo stick (weaving the pork into the bamboo stick) skew about 5-6 piece of pork per bamboo stick. Lay the skewer on the prepared baking pan in a single layer. 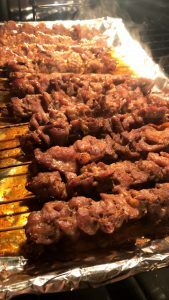 Next, bake the thit nuong for 10-15 minutes then turn the skewer and bake for another 10-15 minutes…after…turn the oven to broil to and bake for a couple more minutes…until the top is has a little crust (burnt) and a very NICE crust. Transfer the meat onto a serving platter. You can serve thit nuong atop rice noodles, steamed jasmine rice, or inside a baguette along with all the fixings—fresh mint, shredded lettuce, sliced cucumbers, pickled carrots and daikon, toasted peanuts, scallion oil, fried shallots, and nuoc man (fish sauce). Slicing the pork into smaller pieces for the food processor. 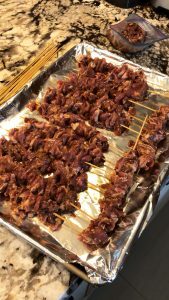 Thit Nuong…ready for the oven…350 for 10 minutes then flip another 10 minutes…then broil for a couple of minutes so it can get the nice crust. Ready for the oven. If you have an outdoor grill..these will taste 100x better on an outdoor grill. 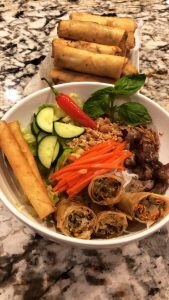 Thit Nuong in a vermicelli noodle bowl with egg roll, cucumber, herbs. SIDE NOTE: Thit Nuong is better cooked in an outdoor grill. The meat will taste so much better…and it will have that nice outside crust.